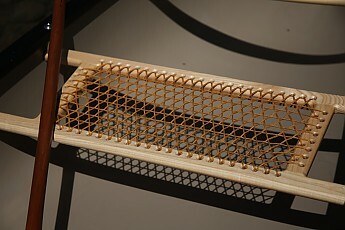 This canoe is based on a Trapper canoe originally built by Chestnut Canoe Company of New Brunswick. 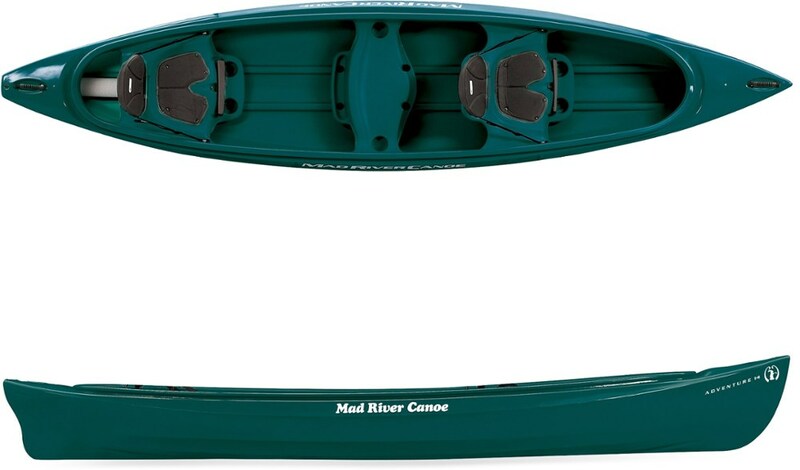 The Chestnut model was designed for trappers who needed a small, lightweight and easily maneuverable canoe for lakes, ponds and creeks. Today, the Trapper in the Nova Craft version is a great all around solo canoe for exploring small waterways and also for anglers wanting a small stable canoe to use as a fishing platform. 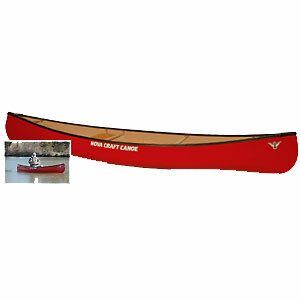 I bought the first production model and had it shipped out with several other Nova Craft canoes that local club members purchased. Initially, I had thought to sell it after testing it, but have decided to keep it as it fits into a category not met by my other canoes. I now have about 60 hours in this canoe. Trapper's canoes were built by many firms in the early 20th century. 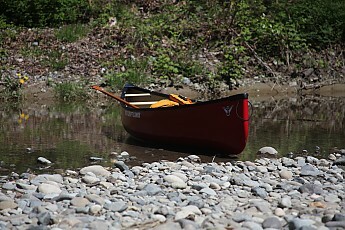 Besides Nova Craft, Old Town also makes a trapper's canoe. There are other names, such as angling canoe, or pack canoe. These canoes were not intended to carry large loads. Nova Craft builds two versions, based on the same hull but outfitted differently. The Trapper 12 is a solo canoe and what I have. They also build a version called the Teddy 12 which is designed as a small tandem for children. This makes this boat a unique offering. As I teach canoeing to children, as well as adults, I have long wanted a canoe sized for children so that they could learn to handle a canoe sized for them. Both the Teddy and the Trapper are excellent for teaching canoeing skills. As well, both versions have enough capacity so that children can pack some gear in their own boat while tripping with adults in a standard sized canoe. The basic dimensions for both versions are a length of 12 feet, a 34 inch beam, depth at center of 13 inches and height at bow and stern of 18 inches. The hull shape is symmetrical with minimal rocker. Weight is listed in the Royalex Lite material as 39 pounds. The Teddy version comes with two seats and a yoke, the Trapper is strictly a solo boat with one seat. Laced or nylon web seats are available. The seats and thwarts are ash, and the standard gunnels are black anodized aluminum. Ash gunnels are available for an extra charge. 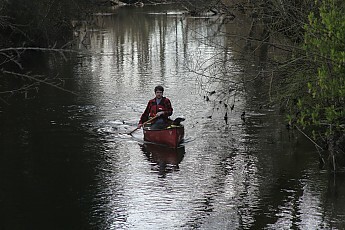 Old Town's trapper canoe is called the Pack Canoe. It is also 12 feet in length, but narrower at 32 inches and with fewer thwarts. 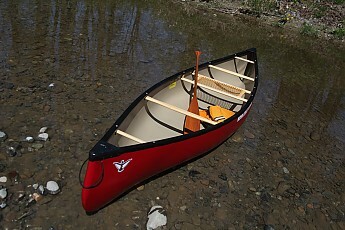 The Old Town Pack canoe weighs 32 pounds. The weight difference is no doubt due to the lack of thwarts in the Pack Canoe. The Trapper and Teddy are available in various materials including Aramid Lite which weighs a diminutive 29 pounds. A note about Royalex. Although Royalex is a trade name for an ABS composite, different canoe builders specify how many layers are used in a Royalex sheet for a particular boat. This accounts for some substantial weight differences when comparing boats from different manufacturers or similar boats from the same company. The design of the Trapper/Teddy is symmetrical with a shallow arched bottom. The bilges are gently curving and the sides slightly flared. 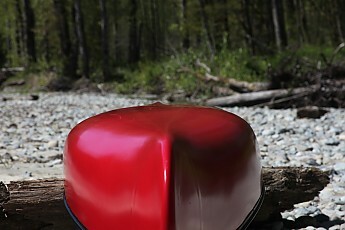 Usually canoe builders will use different bottom shapes to achieve different attributes. A shallow arched bottom will feel a little tippy to the complete novice, but is faster and more stable when leaned. It also adds some stiffness to the bottom without increasing material thickness. Conversely, a flat bottom such as the Old Town Pack Canoe has, will feel very stable at rest, but will be less stable when leaned. It will also be slower. The build quality is on par with other Royalex boats. I have several Nova Craft canoes in my stable, and this boat exhibits the nicely varnished thwarts and seats, careful molding and trim installation of the others. As with any molded or composite boat, there will be slight surface variations that may be visible in strong light, but these will only be noticeable to the trained eye and will not affect performance. In any case, after the first few outings, there will be enough scratches that you won't notice any molding blemishes. I had anticipated that because of its short length and wide beam it would be a bit of a dog. My first paddle proved me wrong. The boat feels very lively, and on and offside leaning turns are easily accomplished without any feeling of instability. And the boat is faster than I expected. It is easy to reach and maintain a good rate of speed. No doubt the arched bottom and gently curving bilges help in the speed and turning departments. While those features might make the boat feel tippy to a complete novice, a few hours time with the boat will increase confidence quickly. The secondary stability is quite good, and it is possible to lean the canoe to the gunnels without feeling any trepidation. The capacity is somewhat limited for a solo tripping canoe, but there is enough room and capacity to throw a weekend's worth of gear in the boat and not feel like you have to trim your creature comforts. When families go canoe tripping with youngsters, the kids are almost always stuck in the middle of their parents' big canoe. Although there are paddles sized for kids, the middle of a big canoe is not the place to learn how to paddle. Seating, even if purpose built, is in the wrong place, and the depth of a big canoe makes it hard for children to reach the water with their small paddles. The Teddy 12 solves all of that. Now the kids have a canoe that is a scaled down version of the larger canoe and the young paddlers can now carry some gear and learn bow and stern strokes easily. 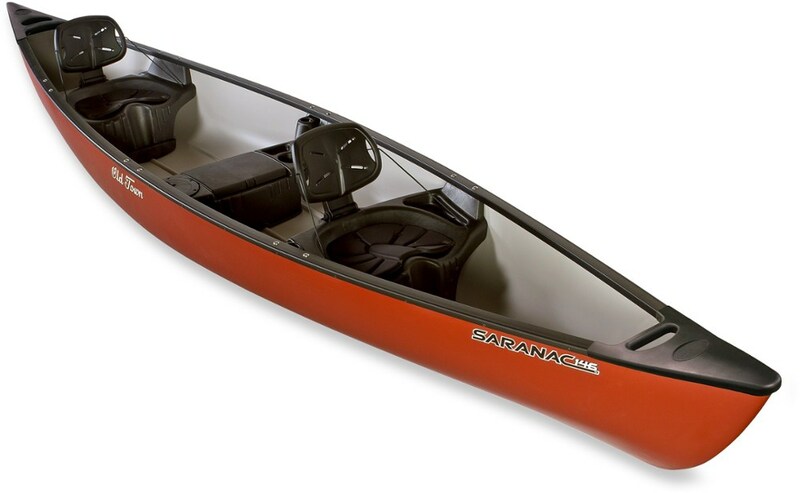 The Trapper 12 is a great boat for the solo canoeist who enjoys paddling lazy creeks and small lakes and ponds. It is intended mostly for recreational day paddlers and anglers, but has enough capacity to take gear for several days of exploring. 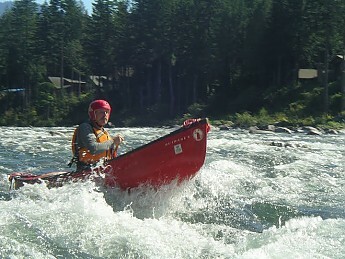 It is also a good tool for teaching paddlers how to solo a canoe. The Teddy 12 is a nice tandem for children. For a family with one or two children, this boat is the perfect mate to the larger boat the parents paddle. 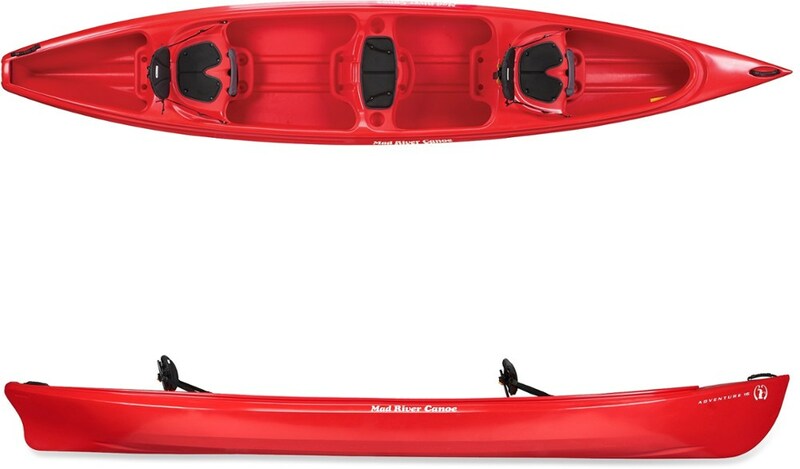 With enough capacity for two children and some gear, this is a great way to get kids involved in canoe tripping and being in control of their own boat. I have been a paddler since the late 1960s. I paddle open canoes in white water and have done more than a dozen extended trips in Northern Canada. I also teach canoeing. My other primary outdoor pursuits include back country skiing and hiking. Canoeing is a potentially dangerous sport. The author and publishers can accept no responsibility for any injury, loss or inconvenience sustained by any person as a result of information contained in this review. Always wear your PFD when on or around the water. Know your limits, and leave a trip plan with a responsible person. Canoeing alone is not recommended. Thanks Erich, I enjoyed the review. 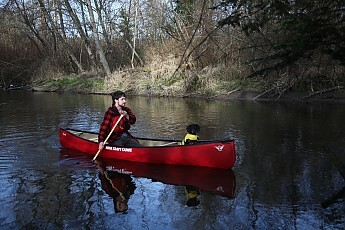 I am planning a few solo canoe trips in small creeks in the near future so anything I can learn is most useful. One of the best canoe reviews I have ever seen. Well done. If you are looking for a nice, small boat to toss in the back of your truck or sling over your shoulder for small rivers and ponds, I highly recommend it. It is a unique little boat that I think I will keep for a long time. Easy to throw it in the bed of a truck or on your roof and go. Like any shorter canoe, top speed is not all that fast. It's not made to race, though. Don't push her and she'll be fun to paddle. This boat is another Nova Craft offering originally built by Chestnut in wood and canvas. It is symmetrical and has a shallow arch bottom. Fit and finish is excellent, as most Nova Craft boats I've seen. The laced seats are the most comfortable on the market and I'm unsure why Nova Craft is the only one to use them. Mine is Royalex, but lighter composite models are available. I was a bit dubious when talked into trying this little boat out. My prior experience with my XXL 6'2" frame in a 12-foot canoe was less than pleasurable. But, I gingerly climbed into the little boat and pushed off figuring it would be a submarine or a tub. It was neither, it is a pleasant little boat. The shallow arch hull emphasizes secondary more than initial stability. It turned predictably and didn't spin like a top, as I thought it might at that length. It has just enough rocker to make for easy, predictable turning while not so little that the stems "Dig in" with a heavy load. As I gained confidence that my size would not sink the diminutive canoe, I began testing its limits. I took it out into some significant boat wakes on the Chattanooga riverfront and it handled them like a champ. I could lean it almost to the gunwale and it felt reassuring. A few months later and I was in the boat again, this time having bought it. I've had it on both ponds and rivers now and it excels on both. Most folks look at the 12' x 32" specs and think it would have to paddle like a pool toy or spin like a top. But the narrow (for Royalex) stems and shallow arch seem to overcome the width to length issues. You won't win any races in it, but you will enjoy paddling it if you don't plan to be doing any 20-30 mile per day slogs. Now, I've already explained that I'm a big, tall guy and it suits me for day tripping even in winter with extra gear. I would also have no problems doing an overnight in this in summertime. But, also, my much smaller wife also likes the boat. She's tried it sitting from the seat and using a double blade and kneeling with a single and she prefers to use a double blade in it. And the friend whom I bought it from is also a small guy and found it enjoyable. He too used a single blade. So "size" doesn't seem to be a big issue on enjoyment or usability. I've had close to 400 lbs (probably top end for the boat) with gear. My friend and wife as little as a 130-lb load. While it would work with a double blade, I think kneeling with an Ottertail paddle is the perfect way to enjoy this little boat. Welcome to Trailspace, Terry! Thanks for sharing a helpful review of your Trapper Solo. I'd love to see some pics of your yak in use if you're willing to add them to your review. The Nova Craft Trapper Solo is not available from the stores we monitor.